Many city kids are terrified of animals of all kinds: even squirrels in the park. Today scientists think that "Nature Deficit Disorder" is linked to the increase in hyperactivity, ADD and other behavioural disorders as well as stress. Dog Talk is out tomorrow in the print version of the Weekend section in The Star, the Malaysian national daily. It discusses what nature deficit disorder is, and how you can get kids to connect more with nature. I've mentioned that a pet like a dog can be a great way to get kids to connect with nature. But as mentioned before, there are some things to consider. Generally speaking, medium sized shorthaired dogs are big enough to be robust and easiest to groom. Kids must be old enough to be able to care for their pets properly. We were given our first dogs when we were 11 years old. Also, consider adopting a puppy aged 9 to 16 weeks and then making the kids take the new family member to training classes. This will teach kids and dogs to take care of each other. Remember that the average dog lives for 15 years. This means it is likely kids will go off to college when the family dog is medium aged. At this point the adults left behind will have to take care of the pet. If you don’t feel a dog will be a member of your family, don’t adopt one. Instead, get your kids to help out at the local animal shelter, or take them on outings where they can interact with nature. The a Malaysia Nature Society offers some fantastic opportunities. Do kids have nature deficit disorder? Are your kids really spending enough time outdoors? Combat Loaded & Mission Ready! Blog written by Ee Lynn, the woman who runs Green Living, a Malaysia Nature Society venture that gets kids out in the country. SPCA and Paws: Malaysian organisations that always need volunteers to help with the animals. Arjun may still be wearing a blue collar with red MBPJ 2008 license & silver identification tag (with owner's address, phone numbers etc. engraved). Last seen on Wednesday, December 10, 2008 @ 2pm around Jalan SS1/11, 47300 Petaling Jaya (nearby SRK Kampung Tunku primary school, 7-Eleven convenience store & Kampung Tunku Post Office) and he may have travelled >8km away. Arjun was spotted by residents in SS24, SS25 Taman Megah PJ & SS26 Taman Mayang PJ between January 13 - 24, 2009 walking into people's homes looking for help but was chased away every time unfortunately. More Photos, Video, Info & Updates @ http://arjuncreamie.blogspot.com/ & any useful information leading to Arjun being found will be rewarded, thanks for your kind help! COT: Gong Xi Fah Cai! Gong Xi Fah Cai! May this Year of the Ox bring you all happiness, wealth, health, success, luck, love and lots of fun. I've been away visiting my mum in Spain. The day after I arrived there we had several feet of snow. We got snowed in for 4 days and afterwards enjoyed fog, ice and other lovely weather. First time it's been that bad since 1977 apparently. I am now back in warm, sticky Malaysia, cuddling the cats and making up for being away. They had the other half at home spoiling them rotten but you know cats: they want everyone around all the time! It's Chinese New Year and Au has clean ears for the occasion. He managed to get some goop in those little fuzzy shells so he had to be helped out. He didn't enjoy the experience. Hey there, what'cha doing? You're not going to cuddle me are you? "Whatever it is you're up to, I don't want to!" "Oh no! Eek! Yuk! You're cleaning my ears! Help me someone!" "I am never talkign to you again! I am going to sit out of your reach and stare at you with my laser eyes." For more Cats on Tuesday, visit Gattina. PS for those not celebrating Chinese New Year, Gong Xi Fah Cai pronounced Kong Hsi Fah Chai is Mandarin for Happy New Year. I'm back from a fortnight's visit with my mum in Spain. It took 2 hours to fly from Madrid to Amsterdam, another 8 hours layover and 12 more hours to fly to Kuala Lumpur. Jet lag is making my eyes pink and my head ache but Target and Au are purring me better. They were so happy to see me after 14 days absence, that they haven't turned their tails to me this time! Tom spoilt them rotten with roasted chicken and yumy carry out food while I was gone and took leave to stay at home with them. They are certainly very lucky fuzzies. There's an extra Katz Tales out tomorrow in the print edition of the Malaysian national daily The Star, Weekend section, because some wonderful advertiser wants to place an ad. Hooray! Bless the advertisers who ensure a steady flow of $$$ for cat biscuits. Tomorrow I'll be writing about Qwill, the 16 and a half year old Siamese who lives with my mum. That's him peering blearily at me in the picture above. he always turns his head away when you try to take his picture. It took me days to snap this picture! Check out more about him in the newspaper. There is a disfigured shape of a diamond on Galgal's head, light brown in color. Is your dog bored with unending monsoon weather? When it’s too rainy to go out and play, an indoor treasure hunt is the answer. Treasure hunts are simple: hide the toy in the house and get your pet to find it for you. Learning treasure hunting involves teaching the fetch, drop and search as well as learning toy names. Tomorrow's Dog Talk published in the Malaysian national daily The Star explains how to go about setting up this game. Reminder: The Star will only publish one Katz Tales and one Dog Talk a month from now on. Dog Talk is out tomorrow on 17th January, Katz Tales will be out 31st January. Adopt me! Yuni pictured on the right here is not a good guard dog because she’s very friendly. But she’s a very loving companion and likes kids. Yuni has been vaccinated, dewormed and spayed. Her daily expenses are covered by the Furry Friends Farm’s LACES project (Love and Care for Every Stray) but she now needs a forever home. If you want to adopt her please email sabrinayeap AT gmail.com or sms to 016-6319018. Don't forget to include your name, town and contact number so the prize can be sent to your home/office. Here's Target in his box. He hides insides and paws us as we walk by. Reminder: I've been told by The Star that Katz Tales will only be published once a month from now on. Dog Talk will be published once a month too. Dog Talk will be out 17th January, Katz Tales will be out 31st January. Happy, lucky, healthy, wealthy, fun, succesful New Year everyone! 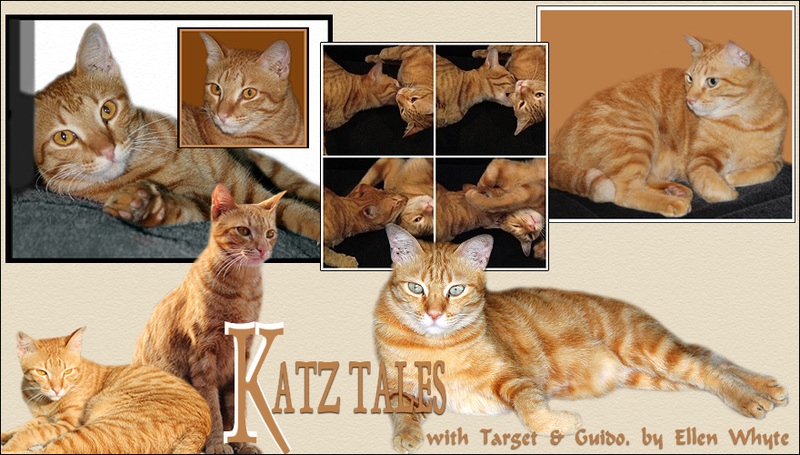 Last minute note: I've just been told by The Star that Katz Tales will only be published once a month from now on. Dog Talk will be published once a month too. Tales is out tomorrow; Dog Talk will be out 17th January. Target is a very quiet cat, which can be a problem when he's stuck in a bush or something because he doesn't think to meow to attract our attention. We've been teaching Target to talk and it's working GREAT! This week's Katz Tales column in the Malaysian national daily, The Star Weekend section is all about teaching cats to talk, and understanding their communication techniques. There's a sidebar of tips for those are new cat lovers. This picture here of Target with his tail up like a flag pole is his way of saying, "Bingo! Found the bag with the chicken. This is the shopping for us cats!" One bit I couldn't squeeze into the column this week: a cat that cries continually is in trouble. There may be a physical problem that is hurting your pet. Cats who aren’t neutered, also suffer from sexual urges that make them noisy - and smelly in the case of tomcats. Neutering can solve this problem. Also consider that continuous crying is a classic sign of stress, anxiety, and depression. In the case of single cats who are house or appartment bound, this crying need may be solved with the addition of a cat companion. If in doubt, consult your vet for advice. The idea offered by some that throwing cold water over a cat to teach them to be quiet is cruel. You wouldn't like it if someone threw a bucket of water over you when you tried to have a conversation, and your pet doesn't either. Accept that cats are as different as people. Some are chatty and some are quiet. If you can't stand a chatty cat companion, adopt an adult cat so you can match your communication styles. If you are thinking of adopting a cat, consider 5 month Ivory, a very active and talkative kitten who meows whenever visitors are in the cattery. Here she is, looking very cute in her collar, and with her tail up showing her interest. Call the SPCA Penang at 604-2816559 or email spca4060@streamyx.com.